Permissions (UPDATED): For data rooms created before August 20, 2018, the print and download permissions can still be managed under the Data Room Settings. If you don’t see the Permissions section in your data room settings, please go to the Invite People to Data Room section. 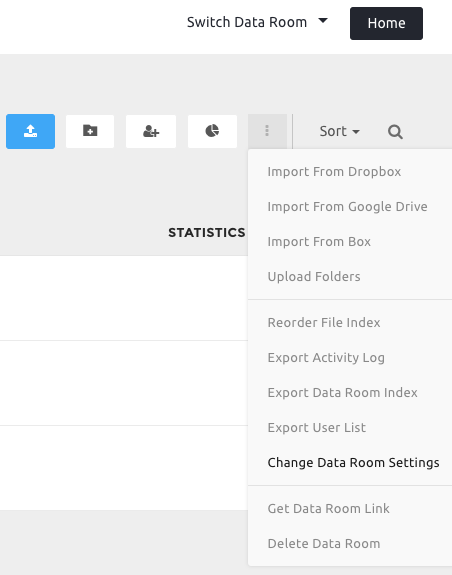 Read more about how to set print and download permissions in your data room. Watermark: Consider using a watermark if you want to brand your files or simply emphasize the confidentiality of the information you are sharing. For a more secure and professional experience, your recipient’s email address will automatically show in the watermark itself. You can then customize the text, size and color of the watermark according to your needs. See how the Digify watermark works. Data Room Expiry: Set an expiry if you want the data room to only be accessible for a certain period. File Index: Turn the File Index feature on to have the option to change the viewing order of the files in the data room. Your co-owners and contributors can also arrange the order of the files. New File Notifications: Have the option to send automated New File Notifications to everyone in your data room whenever new files are added. All data room users will have an option to mute the new file notifications on their end. Terms Of Access (For Team/Enterprise only): Turn the Terms of Access feature on to require data room recipients to agree with your terms of access (similar to an NDA) upon accessing the data room. Hide access list from recipients: Check the box if you don’t want your individual recipients to see who else was invited to the data room. Click Change Data Room Settings.